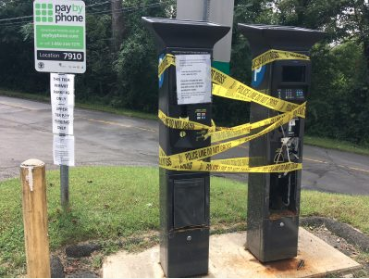 New Canaan officials on Tuesday gave initial approval for a $19,508 contract to replace the two pay-to-park machines destroyed by thieving vandals (or vandalizing thieves) earlier this month at the Talmadge Hill Railroad Station parking lot. The vandalized parking pay machines at Talmadge Hill Railroad Station. The “Parkeon Strada BNA PAL” machines from Wescor Parking Controls Inc. of Auburn, MA will take about eight to 10 weeks to arrive once approved by town funding bodies, Parking Manager Stacy Miltenberg told members of the New Canaan Board of Selectmen at their regular meeting. One of the machines had its “whole insides taken out” during the vandalism, discovered Sept. 7, Miltenberg said. “They attempted to break into the other machine, but when they found, I think, that there was not much money in the first, they abandoned the idea of breaking totally into the second machine,” she said. The case is under investigation by the New Canaan Police Department. First Selectman Kevin Moynihan and Selectmen Kit Devereaux and Nick Williams voted 3-0 in favor of the contract. Bill Oestmann, buildings superintendent with the New Canaan Department of Public Works, said state transportation officials have approved a plan to relocate the machines from an upper-tier lot at Talmadge Hill to the station platform. Williams asked whether surveillance cameras are in place there (no) and whether the town has insurance on the machines (yes, but with a $25,000 deductible). New Canaan Police are investigating the destruction of the two pay-to-park machines at Talmadge Hill Train Station, officials say. Serving the upper tier at the mostly permitted commuter parking lot, the twin machines were found destroyed on Sept.